I’ve boiled my last pot of drinking water, hand-washed my last bucket of clothing, and had my last sitaphal (custard apple). I’m just about out of washing powder, peanut butter, and rhododendron syrup. It’s time for me to go. I leave behind some amazing people, whom I haven’t seen often enough. (It’s amazing how little you see of friends when you get off the visitor’s circuit and adopt the lifestyle of a resident.) And an amazing city that, despite all it’s infrastructure problems and overpopulation, rocks. I’m going to miss pani puri, fruit, and fruit juice, auto rickshaws, and clothing that costs Rs. 100 (US$ 2.50). I’m looking forward to sitting on a western toilet (as opposed to squatting over a hole in the ground), the ambient quiet of life without fans, and sour dough bread and cheese. I love it! Librarywala.com will deliver books of your choosing from a list of over 8,000 titles ranging from Business & Management to Sports within 24 hours in Bombay. The Netflix model applied to books and Indianized – a deliverywala will show up at your door. Books are relatively expensive in India (unless you count the pirated paperbacks full of typos and missing pages sold by the homeless in major street intersections). For example, we paid full price (Rs. 975 or US$ 24) for the latest Harry Potter (hardcover) at the local Crossword bookstore (the cheapest available in Bombay was in “town” for Rs. 675). Most of our young Mumbaiker friends did not buy the book because they would not think of spending that kind of money for anything (except electronic gadgets). Paperbacks range from Rs. 250 to Rs. 595 (US$ 6.25 to US$ 15). In comparison, I just bought a “better quality” carry-on size dufflebag for Rs. 250 and you can buy clothing as well as shoes for Rs. 100 to 200. At Librarywala.com, for a Rs. 499 one-time registration fee, a Rs. 499 refundable security deposit, and a monthly fee of Rs. 199, you can borrow up to six books, two at a time (children can borrow up to 10 books, two at a time). For Rs. 299 a month, you can borrow 12 books, three at a time. Fun for the whole family! In my previous post, I mentioned that many teachers in India rarely showed up in school but instead, got paid to tutor students privately. Now that coaching centers have become big business, the situation is even worse. The following article from the Mumbai edition of the Times of India, does a good job of explaining why. Mumbai: Ritika Deshpande (name changed) quit her job last year as the principal of a reputed suburban school as she was fed up with taking home a measly salary of Rs 8,000 a month. “The school management would credit Rs 15,000 to my bank account every month, and then force me to return around half the sum in cash,” she said. colleges across the city, so that, on paper at least, they can prove they’re paying teachers according to government payscales. Deshpande, who now works in a coaching class, gets a salary thrice the amount she took home as a principal. mainstream education system in droves and making a beeline for private tutorials, where payscales can range from Rs 12,000 to Rs 1 lakh a month, unlike the Rs 10,000 to Rs 15,000 most schoolteachers earn in the city. takes home a salary of Rs 5,000 a month, though her pay cheque mentions Rs 22,000. She supplements her income by teaching at a well-known coaching class. Priti Pandit, who taught in a Kandivli school, now works in a coaching class. Her income, she added, has nearly tripled after leaving the school job. Coaching class directors are quick to say that it’s not just the money. There is more job satisfaction in the coaching industry, they feel. “In our tutorials, teachers don’t have to correct answer papers or draw up marksheets. Their job is only to teach in the classroom. We hire a separate staff for administrative work and to correct answer papers,” said Narayanan Iyer, executive director of Mahesh Tutorials. Of the 50,000-odd teachers employed with coaching classes in the city, around 50% have been recruited from schools and colleges, according to Narendra Bhambwani, secretary of the Maharashtra Class Owners’ Association. “The rest of them are freshers who join the coaching industry directly,” said Bhambwani. Those who opt to teach in the mainstream education system, say they do so out of love for the job and not money, as their monthly income barely covers the rent. Schoolteachers who do not come from wealthy families take tuitions on the side to make ends meet. Ironically, teenage call-centre employees often earn the same as teachers, though the latter may have been in the profession for several years. Presently, at all schools, except civic primary schools, newly appointed teachers are hired at approximately Rs 3,000 a month on a three-year contract, after which they are made permanent. kindergarten teacher at a private school in Borivali earns Rs 4,000, 25 years after she joined the profession. She handles upto 60 children in a single classroom. 10,000 to Rs 16,000, while the state government scales for secondary and higher secondary teachers range from Rs 9,000 to Rs 25,000. While civic and government payscales are applicable to private schools, these institutions are free to pay more than what has been prescribed by the government, but not less. However, a number of well-known private schools that charge students a hefty fee do not pay their teachers any better than municipal schools. A secondary teacher at a popular south Mumbai ICSE school was receiving a monthly salary of Rs 16,000 even after 15 years of service. Teachers at an IGCSE school in Vashi said they are upset that their salaries range from Rs 10,000 to Rs 20,000 a month. When Arvind Vaidya retired as the principal of Nandadeep High School, Goregaon, in 1988, he was drawing a salary of Rs 800 a month. “I don’t think that teacher salaries have improved significantly over the years. Though teachers are earning more than what they did 20 years ago, this is only a ompensation for inflation,” said Vaidya, who now heads the Private Primary Teaching and Non-teaching Staff Association. Undergraduate and post-graduate teachers fare better than their counterparts in schools and junior colleges, with senior teachers earning upto Rs 40,000. However, Tapati Mukhopadhyay, general secretary, Bombay University and College Teachers Union, pointed out that while a B-school graduate gets a minimum starting salary of Rs 50,000 a month, a senior management teacher gets a lot less. Rs. 20,000 is the typical bribe that must be paid for filing or renewing an 80G (which is kind of like a US 501(c)3 but allows your donors to deduct 50% of their donation from income taxes). This is pretty much standard in any part of India except in Delhi, where the crooks in the Income Tax office will only renew your certificate for one year, as opposed to the standard three years. Once an NGO or group of NGOs have fixed up the run-down buildings and made a home for themselves, the “requests” and sometimes threats begin. “Why don’t you help us renovate our school building – look at the conditions the students have to face. Why don’t you make a nice garden on the school grounds? Why don’t you build a playground for the students?” And every time an NGO gives in and pays for a renovation, the official in charge takes credit for the renovation, bills the BMC, and pockets the reimbursement. If the NGO refuses to cooperate, they are threatened with eviction. One NGO was even given a fake letter from the Department of Education (written by a Deputy Education Officer) that the policy of allowing NGOs to rent school property had been changed and that the policy would be applied retroactively, throwing out all NGOs that are already in school buildings. And the list goes on. What do the NGOs do? They pay what they have to pay and get on with their work. For if you fight the petty bureaucrat, a higher-level bureaucrat will come down on you even harder. 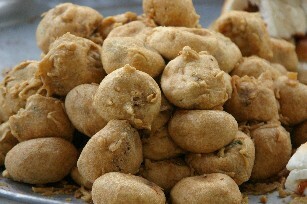 Vada pav (pronounced “pau”) is the ubiquitous snack of Bombay. It is what millions of the poor and students eat to fill their bellies, and what all other Mumbaikers have as a snack any time of day. Ask any college student what her favorite food is, and the answer will be: vada pav. 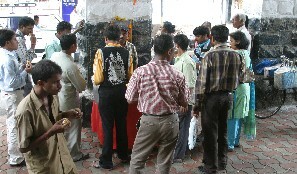 The vada pav stand pictured above, is located at the main entrance to the Grant Road station, on the East side. Because it is mobbed from the time of set-up to the time the vada run out, it is a three-man operation. One man separates the pav into units of two, slices them in half with a long, serrated knife, and then slathers the inside of the pav with imli (tamarind) chutney (which is sweet and sour) using a large ladle. 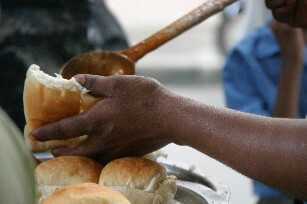 He then sets the buns on the lid of the large imli chutney vessel. The pav are stuffed with vada by a second man and handed out to waiting hands and mouths. (There is a smaller vessel of coriander chutney as well as a bowl of whole, raw green chilies for those who want to doctor up their vada pav. ) The third man wraps the orders to go and takes the cash: Rs. 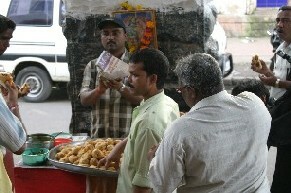 5 per vada pav. (U.S. 13 cents at 40 rupees to the dollar.) Most people have two. SHE Creates is a month-long initiative of Mam Movies, in association with Laadli, a girl-child campaign of Population First, to give girls a voice through the medium of film. This workshop was geared to critiquing footage shot by the girls on Sunday – their very first day of shooting – and to introduce the editing software they would be using to complete their films within the next week and a half! The first footage we saw was taken by the girls from Uncle’s Free Coaching Classes. “Uncle” and his family (in particular, his daughter Rehana), educate Muslim girls in different neighborhoods in Bombay, giving these girls their only opportunity for informal education and vocational training. Uncle’s girls are making a film on bride burning and harassment. When the script was being developed, Meghna (one of the co-founders of Mam Movies) asked: “How are you going to depict the burning of the bride?” The girls thought about it and came up with a solution: film the burning of a piece of paper in a dark room. The girls from the Rescue Foundation are also making a film about what they know – the flesh trade. Their footage opens with green, open fields (a village), shows members of a “family”, and the kidnap and eventual rescue of one of the girls in the family. These girls have not understood that they need to make a “real” film, with actors (and not one of them playing the “brother”) – this is not a “street play” with which most of them are familiar. Salma, one of the loudest girls on the team, and in fact, of all the twenty five girls, is uncharacteristically shy when she sees herself on film – she covers her face in her hands and hunkers down in her chair, hiding from herself. The girls from Apne Aap have not had a chance to shoot, but they have a killer (no pun intended) script about female foeticide and have worked out all the details in preparation for their full-day shoot the next day. Maa, why are you sad today? Why are you at the operation theater? Maa, why am I going far from you? The girls from Bombay Cambridge High School haven’t shot anything (they gave the equivalent of “the dog ate my homework” excuse: “we didn’t have any tape”) and had internal conflicts about the script. These girls are the only girls from privileged backgrounds, and they seemed relatively immature for their age (12 and 13) and their standard (8th grade). (Mam wanted to have a more balanced distribution of groups, with two groups from privileged schools and three from informal, NGO programs, but one of the private schools backed out at the last moment.) You could tell that most of them didn’t take this initiative seriously (three of the girls from Bombay Cambridge were the only ones not wearing the program T-shirts) and were having difficulty coming up with a script with which they could identify. They had a couple of scripts in mind – one on early marriage and one on gender restrictions in middle class families. Madhu (the other co-founder of Mam) spent some time talking them through a script during a break in the workshop, and Akash and Rahul, two Mam volunteers, accompanied the girls back to their school so that they could provide additional guidance. Whatever Akash and Rahul said to them worked. Rahul got a phone call later that evening with a revised script that was excellent: Part 1 – a lower class girl is forced into early marriage. Part 2 – a middle class girl is refused international travel for a sports competition. Part 3 – an upper class girl is not allowed to take a high-paying job on the night shift. End – narrator: No matter what the class, why don’t girls have a say in their own future? There is an announcement in Hindi, and in a few minutes, the curtains open and the stage is set for musical performances, not dance. A sitar player and tabla player are seated on the raised platform. Clearly, the sitar player is the student here. His performance is short. Then a tabla player and harmonium player. The tabla student is pretty bad. Though, again, the performance is mercifully short. Then a vocalist, accompanied by tabla, harmonium, and tanpura. In the middle of the performance, Avani rushes in to the auditorium – you can recognize her by her backpack with the 2 large carabiners hanging off the handle – at 7:45pm! She sees me and runs over to where I’m sitting. She gives me her camera and asks if I can take video. “You just have to press a button right?” I ask. “Yes.” And she sets the camera to video, shows me how to turn it on and off, how to zoom in and out, and how to press that button. “Do you go on after this?” I ask, expectantly. “No, after this there is a prize distribution, then a break, then the Bharat Natyam dancers, then us.” She gives me a look, then says: “If it gets too late and you have to go, just give the camera to the auntie in the blue and tell her it’s Avani’s camera. But if you’re here, nothing like it!” And she rushes off while I dig further into my chair for the long haul. After the vocalist, the principal of the Shikshapeeth comes on stage to give a little speech and hand out the awards and prizes. From her, we learn that the Institute was founded in 1946, and that they just celebrated their “Diamond Jubilee Year” (60th anniversary) . The Institute started out teaching sitar, tabla and vocal, but to keep up with the times, they’ve added “hobby” classes of Sugam Sangeet, harmonium, and Hawaiian guitar due to popular demand. (Hawaiian guitar?!? For some reason, this cracks me up.) Bharat Natyam dance was introduced in 1948 and Kathak in 1957. The classical music and dance programs are 5-year diploma programs, after which students can go on with one-on-one study with a guru. When Avani finally comes on stage, she has the most serious look on her face – one of intense concentration. She starts out in the back, with the other first year. I’m too busy taking still photographs and video to take in much. She rotates to the front with two other girls. Ooops! She makes a mistake – starts a movement too soon. Do I have that on video? No matter. She rotates off the stage shortly thereafter, leaving a stage littered with loose bells flung off ankles and flowers thrown off heads.